This year we recognize the 110th anniversary of our book “The Nursing Sister” and celebrate its legacy in the United States. The Hospital Sisters of St. Francis and Reverend Father Louis Hinssen, Priest Director of their Community from 1886-1905, began St. John’s School of Nursing, a nurse training school for the Sisters, on October 4, 1886, at St. John’s Hospital, Springfield, IL. The course was one year, and as classroom lectures and clinical practice were offered, there were few nursing textbooks available. A text written in Germany by Dr. Paul Rupprecht, and used by the Sisters there, was used by St. John’s in 1890, but by 1893, Father Hinssen and the Sisters found it necessary to write their own text in German, Hanbuch der Krankenpflege (“Manual of Nursing Care”). By 1899, an English text, "The Nursing Sister - A Manual for Candidates and Novices of Hospital Communities" - was published and written by Father Hinssen (pictured bottom left), Mother Paula Speckhart (pictured center), and Sister Theresa Dietrich (pictured upper right). In addition, they published a companion guide “Points for the Clinical Record”. Three other editions of “The Nursing Sister” followed (1900, 1903, and 1905 respectively) and were used throughout the mid 1920s. Also, the books were requested by other nursing schools in the United States. The first edition is entered according to Act of Congress, in the year 1899, by Rev. L. Hinssen, in the office of the Librarian of Congress. Since its primary audience was the Sister-nurse, the book begins with qualifications that included, first and foremost, a love of God and fellow creatures and a purity of intentions. The purpose was to present “theoretical instruction” to the Sister-nurse, which “must go hand in hand” with the “practical side of the training.” In the Surgical Nursing chapter, it is asked what the Sister-nurse must have ready when the doctor changes a dressing for the first time. The answer: “The things she knows he will want.” In response to what the Sister should know after she has once seen the dressing, the answer is, “How to prepare for it the next time.” It is emphasized that the Sister-nurse did all “for the sake of Christ” and asserted that “order, heaven’s first law,” had “a very important place” in the hospital. Leadership Conference of Women Religious (LCWR) has been working to develop a traveling exhibit to chronicle the history of Catholic Sisters in America. The exhibit will show the impact of a small group of women who helped shape the nation’s social and cultural landscape through schools, hospitals, colleges, and other social service agencies. We are pleased to share that “The Nursing Sister” will be included in this exhibit at the Cincinnati Museum Center from May 16-September 7, 2009. While the complete schedule has not been announced, the exhibit does include the Smithsonian Institution from November 2010-January 2011. For additional information, please visit http://womenandspirit.org/. Father Hinssen was born December 29, 1834 in Sonsbeck, Germany. He entered the Seminary at Muenster, Germany, and one year before his ordination (1859), he responded to a request from the Bishop of the Diocese of Alton, IL, for priests in America. Shortly after his arrival, he was ordained and assigned to the parish in Edwardsville, IL. In 1870, the newly consecrated Bishop Peter Baltes appointed Father Hinssen his successor at St. Peter’s Church, Belleville, IL. He served there for 13 years, and after a brief visit to Rome, he was assigned to a parish in Cairo, IL, until 1886. At this time, he began his work as Priest Director of the Hospital Sisters of St. Francis and Director of St. John’s Hospital until 1925. This responsibility included oversight of construction projects at St. John’s, the Motherhouse, and the other sponsored hospitals. According to Rev. A. Zurbonsen (1918), Father Hinssen “had a mind open to progress, kept pace with the rapid strides of improvements that hospitals were making both in regard to their architecture and management, as well as in the nursing care it provided its patients.” He died June 25, 1925. Mother Paula Speckhart was born on October 23, 1861 in Highland, IL. She made her First Profession on October 2, 1882, and served as Mother Superior from 1896-1905. She died March 7, 1935. 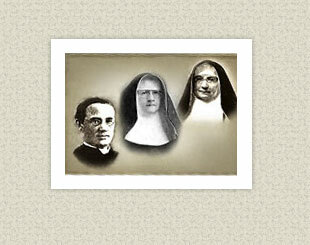 Sister Theresa Dietrich was born on April 23, 1866, in Belleville, IL. She made her First Profession on October 16, 1890, and died June 27, 1951.